customers spend less time looking or booking the services you need or think according to your requirement, be they accommodation, tours, tickets, etc. .. Friendly Web (or web friend) is a concept born from the need to give customers the simplicity while browsing easy to use hence we have discarded the possibility of including cumbersome presentation, clips, leading to loss of time or performance unclear website. Yes......If they surely would be more beautiful, but lose the sense that we wanted to give, I mean the ability to move customers from each point to the one you want, without loss of time to organize your stay in Prague and Czech Republic.. The number of people in recent years has shifted to smartphones is exponential, hence the need to offer our customers the opportunity to use this new form of communication. 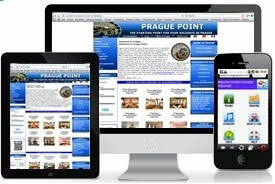 Prague point ... it was always sensitive to changes in technology, and seeks direct contact with customers, hence giving you the chance that if you're on your desktop, your notebook, tablet or smartphone, you are to choose your the most convenient interface to navigate and communicate with us. Choose the one you choose ...., services, friendliness, availability of staff and respond quickly to your needs ... is always the same. 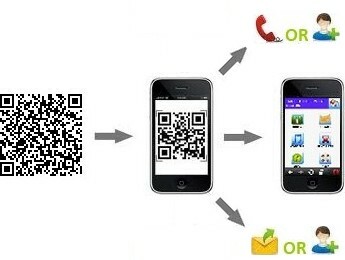 QR (Quick Response Codes) are a type of two-dimensional barcode that can be read using smartphones and dedicated QR reading devices, that link directly to text, emails, websites, phone numbers and more! You may have even got to this site by scanning a QR code! If you have a smartphone like an iOS, Android, Simbian, Blackberry or other OS (system operation) , Whit QR Scanner that can read and decode data from a QR code. The majority app (application for decode QR code) are completely FREE, and all you have to do once you install one is to use your phone's camera to scan the barcode, which will then automatically load the encoded data for you. You can scan it with your application to decode QR code on your smartphone and you will have all our data, you can visit our website, send a e-mail, memorize our phone number or simply it has to stay in memory into your Smartphone when you need it. PayPal allows any business or consumer with an email address to securely, conveniently and cost-effectively send and receive payments online. Our network builds on the existing financial infrastructure of bank accounts and credit cards to create a global, real-time payment solution. We deliver a product ideally suited for small businesses, online merchants, individuals and others currently underserved by traditional payment mechanisms. Other system is by Banking Transfer, a the more secure system for payments and traditional service, , using now all at a cost too low, with most usually use the Internet banking is done in recent years, very comfortable, permeated the control on the payment, and also In this case, we do not we learn the details of your credit card. The beauty, elegance and perfection is in the simple things are ... if something is too complicated moves away from these concepts.